Got a soft spot for Belgian food? Relate to Eleven’s Eggos obsession on a deeply personal level? Ever felt judged by your peers because you eat waffles for breakfast, lunch, and dinner? Don’t worry friend – you’re in a safe place now. We at the G&G don’t judge! We too think that waffles are a better version of pancakes (have you seen their abs?) and knead at least one stack a day to survive. 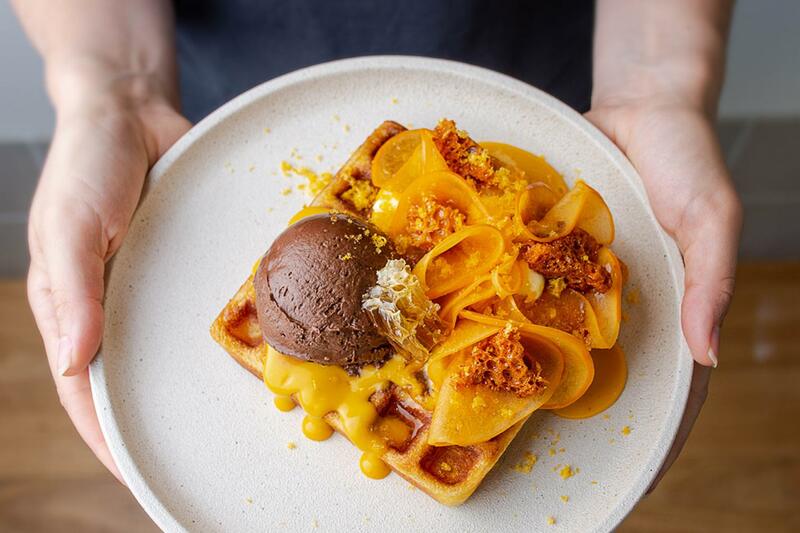 Whether you’re a seasoned waffle-lover, or just getting started, check out our list below of the best waffles Brisbane has to offer. Understanding the importance of bringing beautiful things together, Corner Store Café has created the Banoffee waffle. Imagine a perfect waffle topped with banana, toffee sauce, almond praline ice cream, shaved chocolate and floss. That’s awfully sweet of them. Known for their great coffee, there’s something else to be discovered at this inner-city café. Indulge in cheesecake waffles with whipped cheese, yuzu curd, white peach, roasted white chocolate and macadamia while you’re sipping a cappuccino. If savoury waffles are no-no, then head on over to Nodo and experience the new Violet Crumble waffle. This gluten-free beauty consists of a Dutch waffle, complimented by the flavours of pumpkin custard, neighbourhood honeycomb, persimmon, cacao mousse, crème fraiche, and citrus. There’s nothing little about the larger-than-life waffles at Little Clive. Their monthly switch-up of creative sweet and savoury options like a sticky sesame cauliflower waffle means even the most seasoned waffler won’t get tired. We don’t want to waffle on, but there’s just so much to say about Miss Jones and her incredible Ferrero Rocher Waffles; Belgian waffles topped with Nutella, hazelnut praline, honeycomb gelato and caramel sauce! We’re developing a crush. Or heartburn. Or both. Can you naim a better combo than roasted almond ice cream, caramel, plums and rose? Go on, we’ll wait. And while we wait, you can go try it in Naim Paddington’s truly wonderful waffle stack! If you want to start living la vida loca, head on over to Little Loco, whose eggs and waffle Benedict boasts a savoury ham and cheddar infused waffle topped with two poached eggs and covered in chipotle hollandaise. So rich! Looking to fine-tune your waffle palate? Gauge your expertise at this South Brisbane café, whose sourdough peach waffle, topped with plum, chocolate, sesame and yoghurt sorbet is deliciously decadent. Across town, Kettle & Tin is famous for its own version of fried chicken and waffles, topped with avocado and lime cream and spring onions. Sweet, salty and soulful, this particular breakfast dish has saved many a G&G writer the morning after. Enjoy your waffles like a classic Canuck at Picnic Café with their Canadian waffles: waffles with maple syrup, bacon, lemon curd, vanilla bean ice cream and strawberries. Oh Canada, we’ll stand on guard for these! There’s a waffle lot to love about Brisbane.